As you age, your body naturally loses muscle mass and is prone to gaining more body fat. One of the most effective fat-burning and muscle-building forms of exercise, strength-training exercises help you slim down and tone up. 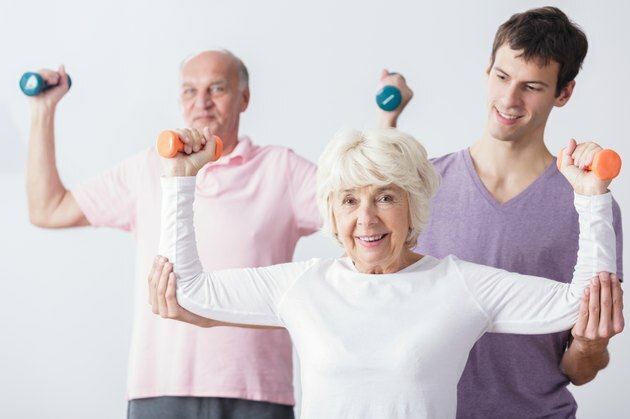 Weight training also helps prevent age-related conditions such as arthritis, osteoporosis and balance problems. Even as a senior, you can use targeted strength-training exercises to tone and build your muscle, and all it takes is a set of dumbbells to get started. The arms are primarily made up of the biceps and triceps in the upper arms, along with the lower forearm muscles. The dumbbell curl is an effective exercise for working muscles in the upper and lower arms. Stand straight with your feet shoulder-width apart, toes pointing forward. Keep your arms down at your sides with a dumbbell in each hand, palms in. Flex your right arm, rotating it at the same time, bringing the weight to your shoulder so your palm is facing you. Lower your arm back down, then repeat with your other arm for one rep. The abdominal muscles -- rectus abdominis, obliques, and transversus abdominis -- are the primary core muscles. To strengthen these muscles, include the stability ball dumbbell fly as part of your dumbbell exercise routine. Lie your upper back flat on a stability ball, legs off the ball, bent on a 90-degree angle with your feet flat. Bend your arms at your sides, at chest-level, so your arms form right angles, a dumbbell in each hand with your palms facing in. Raise your arms up together, extending them nearly fully, so your elbows are straight but not locked. Lower them back down for one rep. The pectoral muscles make up your chest, with the trapezius and latissimus dorsi as the primary muscles in the back. To strengthen these muscles with a dumbbell exercise, try the chest dip and bench press, or the dumbbell lying row. Lie with your chest flat on a bench, resting on the balls of your feet with your legs straight behind you. With your arms straight down, hold onto dumbbells, then bend your arms to bring the weights up to your chest, before lowering them back down. The legs are made up of several major muscle groups, including the quadriceps at the front of your thighs and hamstrings at back, as well as the gastrocnemius and soleus muscles in the calves. To work all of these muscles, as well as the gluteal muscles in your hips and buttocks, try the dumbbell squat. Start in a standing position, feet about hip-width apart, your back straight. Squat down until your thighs are just past parallel to the floor. Don't arch your back during the exercise. Stand back up for one rep. Creating the right workout plan is essential for maximum results, even if you already know all the right exercises to include in it. Aim to include at least two to three workouts a week. Alternate days between muscle groups, so your muscles have that important rest period in between workouts. When your muscles get adequate rest, you gain more fat loss and muscle gain, and also help lessen your risk of injury. Always start with a lighter weight and work your way up, gradually working your way up. No matter what weight you start with, if you keep up with your workouts, eventually you will need to increase the weight. This could be as early as a week into your workouts, or long after. It all depends on the person, but you can safely increase the weight by a 5 percent increment when you are no longer feeling challenged.